You did not just watch the last two Philadelphia Union games. Your instinct is correct: There is no way that just happened. That’s right, there is no way the Union just went cross-country to Seattle for a midweek game against the hottest team in league history, beat them while a man down to end their record winning streak, and then followed that up by defeating the Western Conference leaders while starting nine backups. And Jay Simpson being a hero in both games? While starting his first game in 14 months and scoring his first (and second) goal in 18 months? Uh, no. Then you want to believe they’re playing in the U.S. Open Cup final on Wednesday? It’s just not plausible. Wake up, Union fans. You’re dreaming. This is Philadelphia Union we’re talking about here. You know, the team that’s never won a playoff series. That’s only ever had one winning season. That hadn’t been all that fun to watch since their second season, before Peter Nowak wrecked the joint. A team whose stated motto had been obscured by some more infamous quotations, like something about a little tournament in Brazil and feelings not being in the job description. Their biggest summer acquisition last year was a tattoo artist. Five months ago, the head coach seemed on the brink of being fired. So yeah, there’s no way this club is suddenly one of the most entertaining soccer teams in North America. Are you really trying to say they can win any game anywhere on any day? And yet’s it’s all true. It’s all 100 percent true. Instead, this Union team demonstrated the sort of resilience that we’ve never seen from this club. Both wins were the sorts where they held on for dear life as they filled spreading cracks in a dam, but the dam never burst because the defense held every time. Meanwhile, the Union may have ceded possession in both games, but they seized the moments and finished with fatality and aplomb. Their next two matches are huge. Wednesday is the U.S. Open Cup final in Houston. The stakes are obvious: A trophy. The Union are 5-1-1 in their last seven road games and 8-1 in Wednesday matches this year, but Houston is a team that, at their best, does away with the possession game they’ve tried much of this year and plays much like Montreal: Bunker and counter. The Union, with their slow No. 6 and preference for a high defensive line, have shown their vulnerability to the quick counterattack. Saturday is a six-pointer at Columbus. 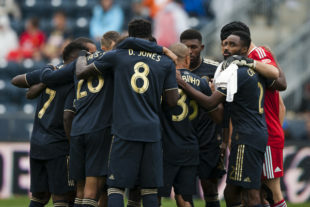 A Union win would see them leapfrog Columbus into fourth place and put them in line to host a first round playoff game. With third place New York City FC in freefall mode, third place isn’t out of the question. It’s a tall order to ask. The history of this club and Philadelphia sports would generally mean you shouldn’t dream it. Lucy always pulls the football away from Charlie Brown. Or you can forget history and evaluate what you see on the field. The Union can play with anyone. Now they just have to beat everyone. I carried it over from todays news cause its likely to get more traffic here…with an additional thought and some spelling corrections. Turns out posting while standing on line– Ring on Deli Key…. does not provide clean lines and language. Oscar Pareja is on the record confirming what I’ve seen with my own eyes and have suspected but was not entirely convinced of …. US soccer is not intrigued in the least with a possession, patient soccer expression. Get the ball. Get it vertical. Our national identity is aggression. The fast break NBA with a ball at the feet instead of in the hands. I see it at academy with Earnie’s philosophy. I see it with the stars at age groups becoming overwhelmingly players of color. I saw it this summer with the academy teams in California and Florida… verticle push push push. I see it and can now finally resolve it. They are on the record. This is the way Earnie taught the academy to play locally. This is Earnie in lock step as GM with the future USNT coach defining a philosophy and cultural expression. ‘If only the best athletes played soccer’ is becoming —–and will become, our national identity. La Pausa. We don’t, but….I sigh. That aspect of footy will be reserved for Barca Academy in AZ and NY…. USDA finalists and/or champions at 16 and 18 I believe last season. Then I realize the World Cup was just won by a team and identity that offered possession gladly, was sound defensively then just destroyed the other teams with violent aggressive and assaulting counter attacks led by a player faster than everyone else. In other words, a pure athlete. Of course, in my opinion that was a coaches identity and not a cultural identity. Zidane could have France playing possession soccer beautifully if he was the leader just as easily. Okay US Soccer. Now I know, and can adjust accordingly. It’s actually a relief. This is a nice time for good old statistics to swing in the Union’s favor. Simpson was due. Glad he never quit working, even when nearly everyone (understandably) written him off. Am so glad I renewed my season tickets last year: best thing I did during Q4, 2017!!! I cannot believe our B-squad just beat the top team in the East. Nor that the Union took 6 points in 4 days from the 2 hottest teams in the league. Did that actually happen?? Or did someone put peyote in my Diet Coke? This team… is… actually… good???? It was not, but … it’s fair that we both responded the same way. We were seeing the same thing. Over the last 25 games across all competitions, Philly are 16-7-2 with a +16 goal differential. Maybe it isn’t just lucky, maybe it is. The Montreal game was bad but something that happens in MLS. 8-2-1 in league play going back to the Houston game. We had no business winning the last few games, but I’ll take it!! Let’s bring home some hardware! Third times the charm. I believe this team will win.